Our Parent Company MORAVIA GmbH was founded in 1952, and has since prided itself in offering high quality products at competitive prices for both the Commercial and Private Marketplaces. As a result of their success, the UK operation has been set up to offer you the same high standards, which have been enjoyed by their customers for 60 years. 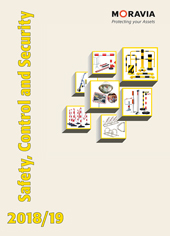 MORAVIA develops and sells a range of products designed with safety and security in mind. These include line markings, mirrors, impact protection, posts, barriers etc. All of our metal protection guards, posts and bollards are manufactured in our German facility and are made to the highest standards of strength and quality. We pride ourselves on customer satisfaction, fast delivery and professional service. We are also an ISO9001:2008 registered company. You can contact us by post, phone, fax or e-mail for information about getting in contact with your local distributor of MORAVIA products.